Famed radio host Charlamagne Tha God talks the black American experience in the age of Trump, and says the president should make a greater effort to open the lines of communication with those who oppose him, like Congresswoman Maxine Waters. Larry King: You have your feelings about the president. Is this still in this book, everything possible for the black America? 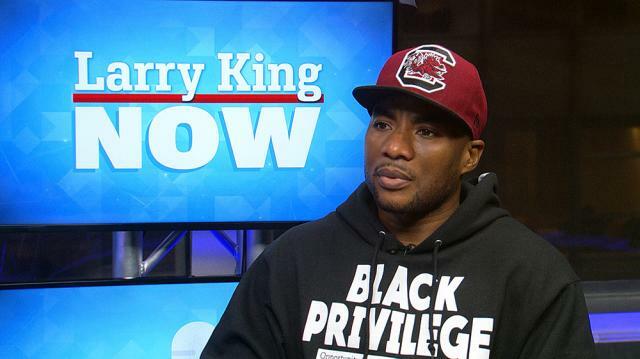 Charlamagne tha God: Yeah, absolutely. Donald Trump’s not God. Nobody in his administration is God. At the end of the day, nobody can stop the destiny that God has planned for you, except for you, and that’s why they give us these messages to make us feel inferior. Because when they plant these messages in our brain of being inferior, it makes us feel like we can’t do it. And as soon as you fix your mouth to say, “I can’t do something,” it won’t get done. Simple as that. Larry King: You think Donald Trump’s a racist? Larry King: Wouldn’t you like to interview him? Charlamagne tha God: It was a point in time when I did say I want to interview Donald Trump, but now I feel like Donald Trump should sit down with somebody much smarter than me. Like I think he should sit down with the people he’s been avoiding, like people who have been fighting these social justice movements for a long time, or are members of the Congressional Black Caucus, people like Maxine Waters. He needs to sit down with people like that, who can actually talk policy with him and tell him how his rhetoric and things are dangerous. Like talking to me is not going to move the country forward in no way, shape, or form.